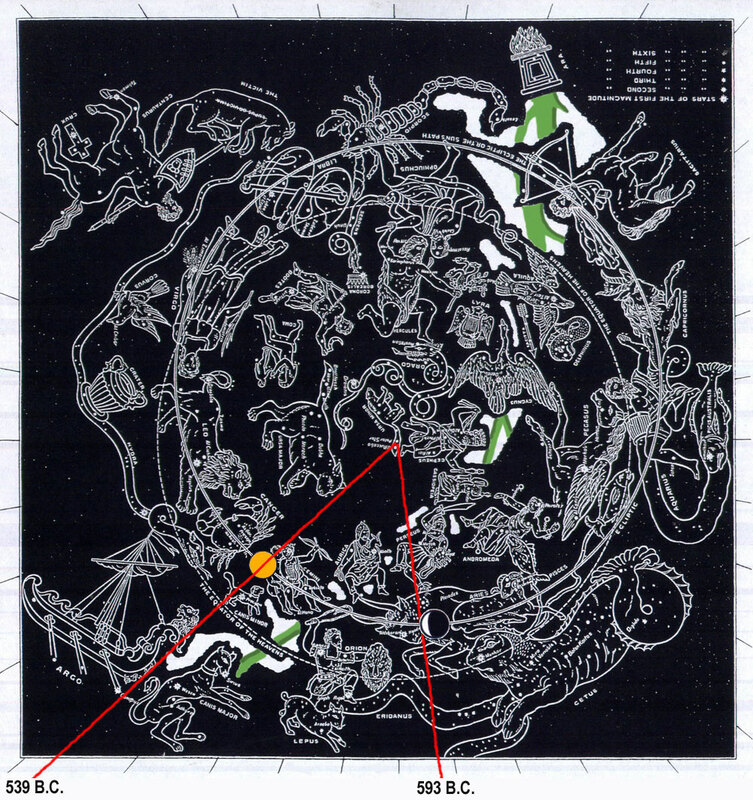 Jeremiah Chapter 50-51 Star Chart: Clockwise from 593 B.C. to 539 B.C. is 54° years. From "the fourth year of his (Zedekiah's) reign" (593 B.C.) (Jer. 51:59) "when thou hast made an end of reading this (lunar or solar) book" and when "thou shalt (red radius string) bind a (lunar or solar) stone to it, and cast it into the midst of (Eridanus) Euphrates" (51:63) till "Babylon is taken" (50:2) and Medo-Persia is told to (red radius sword) "slay all her (Taurus) bullocks" (50:27) and "break in pieces ... the ... (Taurus) yoke of oxen" (51:23) is 54 years. "Babylon hath been a (solar) golden cup in the Lord's hand, that made all the earth drunken: the (Gemini) nations have drunken of her (red) wine; therefore the nations are mad" (51:7). "The broad (red radius line) walls of Babylon shall be utterly broken, and her high (solar bronze) gates shall be burned with (solar) fire" (51:58). Red radius line "shame hath covered our (Argo, Gemini and Taurus) faces" (51:51). 2 Declare ye among the nations, and publish, and set up a standard; publish, and conceal not: say, Babylon is taken (539 B.C. ), Bel is confounded, Merodach is broken in pieces; her idols are confounded, her images are broken in pieces. 3 For out of the north there cometh up a nation against her, which shall make her land desolate, and none shall dwell therein: they shall remove, they shall depart, both man and (Taurus) beast. 4 In those days, and in that time, saith the Lord, the (Gemini) children of Israel shall come, they and the (Gemini) children of Judah together, going and weeping: they shall go, and seek the Lord their God. 6 My people hath been lost (Aries) sheep: their (Gemini) shepherds have caused them to go astray, they have turned them away on the mountains: they have gone from mountain to hill, they have forgotten their restingplace. 8 Remove out of the midst of Babylon, and go forth out of the land of the Chaldeans, and be as the (Taurus) he goats before the flocks. 9 For, lo, I will raise and cause to come up against Babylon an assembly of great (Gemini) nations from the north country: and they shall set themselves in array against her; from thence she shall be taken: their (Gemini) arrows shall be as of a mighty expert man; none shall return in vain. 14 Put yourselves in array against Babylon round about: all ye (Gemini) that bend the bow, shoot at her, spare no arrows: for she hath sinned against the Lord. 17 Israel is a scattered sheep; the lions (Argo, Orion and Cetus) have driven him away: first the king of Assyria hath devoured him; and last this Nebuchadrezzar king of Babylon hath broken his (red radius line) bones. 23 How is the (red radius handle) hammer of the whole earth cut asunder and broken! how is Babylon become a desolation among the nations! 26 Come against her from the utmost border, open her (red radius line) storehouses: cast her up as (red radius line) heaps, and destroy her utterly: let nothing of her be left. 27 (Red radius sword) Slay all her (Taurus) bullocks; let them go down to the (red radius) slaughter: woe unto them! for their day is come, the time of their visitation. 29 Call together the (Gemini) archers against Babylon: all ye that bend the bow, camp against it round about; let none thereof escape: recompense her according to her work; according to all that she hath done, do unto her: for she hath been proud against the Lord, against the Holy One of Israel. 30 Therefore shall her young (Gemini) men fall in the (Milky Way) streets, and all her (Gemini) men of war shall be cut off in that day, saith the Lord. 32 And the most proud shall stumble and fall, and none shall raise him up: and I will kindle a (solar) fire in his cities, and it shall devour all round about him. 33 Thus saith the Lord of hosts; The (Gemini) children of Israel and the children of Judah were oppressed together: and all that took them captives held them fast; they refused to let them go. 35 A sword is upon the (Gemini) Chaldeans, saith the Lord, and upon the (Gemini) inhabitants of Babylon, and upon her (Gemini) princes, and upon her (Gemini) wise men. 36 A sword is upon the (Gemini) liars; and they shall dote: a sword is upon her (Gemini) mighty men; and they shall be dismayed. 37 A sword is upon their horses, and upon their chariots, and upon all the mingled (Gemini) people that are in the midst of her; and they shall become as (Gemini) women: a sword is upon her treasures; and they shall be robbed. 38 A drought is upon her (Eridanus) waters; and they shall be dried up: for it is the land of graven images, and they are mad upon their idols. 39 Therefore the (Taurus) wild beasts of the desert with the (Taurus) wild beasts of the islands shall dwell there, and the owls shall dwell therein: and it shall be no more inhabited for ever; neither shall it be dwelt in from generation to generation. 41 Behold, a (Gemini) people shall come from the north, and a great nation, and many (Gemini) kings shall be raised up from the coasts of the earth. 42 They shall hold the (Gemini) bow and the lance: they are cruel, and will not shew mercy: their voice shall roar like the sea, and they shall ride upon horses, every one put in array, like a man to the battle, against thee, O daughter of Babylon. 2 And will send unto Babylon (red radius line) fanners, that shall fan her, and shall empty her land: for in the day of trouble they shall be against her round about. 3 Against him that bendeth let the archer bend his bow, and against him that lifteth himself up in his brigandine: and spare ye not her young (Gemini) men; destroy ye utterly all her host. 4 Thus the slain shall fall in the land of the Chaldeans, and they that are thrust through in her (Milky Way) streets. 7 Babylon hath been a golden cup in the Lord's hand, that made all the earth drunken: the (Gemini) nations have drunken of her (red) wine; therefore the nations are mad. 11 Make bright the (red radiusline) arrows; gather the (solar and lunar) shields: the Lord hath raised up the spirit of the kings of the Medes: for his device is against Babylon, to destroy it; because it is the vengeance of the Lord, the vengeance of his temple (the golden cup) . 14 The Lord of hosts hath sworn by himself, saying, Surely I will fill thee with (Gemini) men, as with caterpillers; and they shall lift up a shout against thee. 23 I will also break in pieces with thee the (Gemini) shepherd and his (white Milky Way) flock; and with thee will I break in pieces the husbandman and his (Taurus) yoke of oxen; and with thee will I break in pieces (Gemini) captains and rulers. 25 Behold, I am against thee, O destroying (red radius line) mountain, saith the Lord, which destroyest all the earth: and I will stretch out mine hand upon thee, and roll thee down from the rocks, and will make thee a (red radius line) burnt mountain. 27 Set ye up a (red radius flag) standard in the land, blow the (red radius tube) trumpet among the nations, prepare the nations against her, call together against her the kingdoms of Ararat, Minni, and Ashchenaz; appoint a captain against her; cause the horses to come up as the rough caterpillers. 28 Prepare against her the (Gemini) nations with the (Gemini) kings of the Medes, the (Gemini) captains thereof, and all the (Gemini) rulers thereof, and all the land of his dominion. 30 The mighty (Gemini) men of Babylon have forborn to fight, they have remained in their holds: their might hath failed; they became as (Gemini) women: they have burned her dwellingplaces; her bars are broken. 32 And that the passages are stopped, and the (red radius line) reeds they have burned with (solar) fire, and the (Gemini) men of war are affrighted. 34 Nebuchadrezzar the king of Babylon hath devoured me, he hath crushed me, he hath made me an empty vessel, he hath swallowed me up like a (Cetus) dragon, he hath filled his belly with my delicates, he hath cast me out. 37 And Babylon shall become heaps, a dwellingplace for (Cetus) dragons, an astonishment, and an hissing, without an inhabitant. 38 They shall roar together like lions: they shall yell as lions' whelps (Argo, Cetus and Orion all have lion heads). 40 I will bring them down like lambs to the slaughter, like (Aries) rams with (Taurus) he goats. 44 And I will punish Bel in Babylon, and I will bring forth out of his mouth that which he hath swallowed up: and the (Gemini) nations shall not flow together any more unto him: yea, the wall of Babylon shall fall. 48 Then the heaven and the earth, and all that is therein, shall sing for Babylon: for the (Gemini) spoilers shall come unto her from the north, saith the Lord. 49 As Babylon hath caused the (Gemini) slain of Israel to fall, so at Babylon shall fall the (Gemini) slain of all the earth. 51 We are confounded, because we have heard reproach: (red radius line) shame hath covered our faces: for (Gemini) strangers are come into the (red radius line) sanctuaries of the Lord's house. 53 Though Babylon should mount up to heaven, and though she should fortify the height of her strength, yet from me shall (Gemini) spoilers come unto her, saith the Lord. 56 Because the spoiler is come upon her, even upon Babylon, and her mighty (Gemini) men are taken, every one of their (red radius) bows is broken: for the Lord God of recompences shall surely requite. 57 And I will make drunk her (Gemini) princes, and her (Gemini) wise men, her (Gemini) captains, and her (Gemini) rulers, and her (Gemini) mighty men: and they shall sleep a perpetual sleep, and not wake, saith the King, whose name is the Lord of hosts. 58 Thus saith the Lord of hosts; The broad walls of Babylon shall be utterly broken, and her high (solar bronze) gates shall be burned with (solar) fire; and the (Gemini) people shall labour in vain, and the (Gemini) folk in the fire, and they shall be weary.